Can Science Save Politics? Or Will Politics Ruin Science? 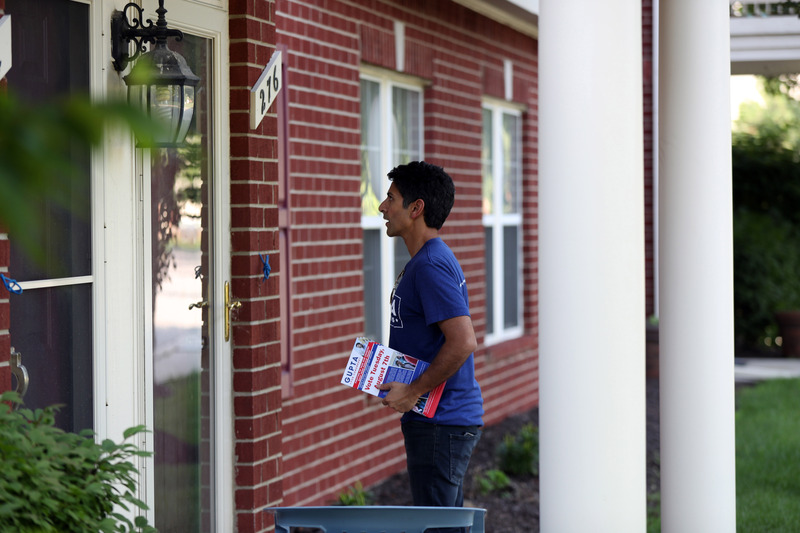 Suneel Gupta, running for the U.S. House in Michigan’s 11th Congressional District, is one of several midterm candidates nationwide testing whether a background in science will appeal to voters this year. Suneel Gupta had his bags packed, ready to go to Washington. It was the night of Nov. 8, 2016, and Gupta, then a tech entrepreneur, was itching to leave the Bay Area and begin a new job in the Clinton White House. He calls it the shortest job of his life. When Gupta tells this story, he presents his run as the logical next step. The Clinton transition job disintegrates in front of his eyes on TV … and yada yada yada … he’s a candidate for Congress. It’s possible it would have felt that natural, that obvious, to him after any election year. But 2016 wasn’t just any election year for scientists. Between Gupta’s personal Point A and Point B, there’s been a whole atlas of cultural movement among scientists, technologists, engineers, and mathematicians, drawing them out of labs and startups and into politics. Thousands of STEM workers and their supporters marched on Washington to protest funding cuts and what they saw as a lack of respect for scientific expertise. Some scientists took it further, forming a political action committee to train and raise money for “science candidates” — a broad category that includes people with experience in research science, science education, engineering and technology jobs. That pro-science PAC, 314 Action, counted more than 300 people with STEM backgrounds who ran or are running for public office at all levels of government — 66 for federal-level and gubernatorial seats. Gupta is one of those 66. Science has never truly been separate from the political system that funds it and uses the tools it creates. But scientists have not traditionally pushed so hard to make that relationship explicit, or to be the ones in charge of it. In the past, said Shaughnessy Naughton, the former chemist who founded 314 Action, scientists have sort of believed that they could just put the facts out there and the evidence would speak for itself. Before this, it had been rare for scientists to get involved in politics. “But it’s clear now that politicians are unashamed to meddle in science. And the way to push back is getting scientists elected. We have to have a place at the table,” she said. “Are you listening for science at all?” I asked her. This is the first challenge that Gupta, and any science candidate, faces. Whenever I spoke with voters in Michigan’s 11th District, they were all more concerned with the state of the roads we had driven on that day than with the technological decision-making behind that infrastructure. Voters — whether in the Michigan 11th or the U.S. at large — don’t seem to view science advocacy as a primary factor in their vote choice. But it’s not for lack of respect for the sciences. For the past 40 years, while partisan divides have increased, the General Social Survey, conducted by the research organization NORC at the University of Chicago, shows that trust in science remained about the same and that the scientific community is the second-most trusted institution in the country, after the military. And you’d expect even more excitement for science candidates in the Democratic Party, whose voters, Pew Research data suggests, are a little more trusting of scientists and a lot more supportive of federal funding for scientific research. In practice, though, the science candidates’ results have been mixed. Of the 23 federal-level candidates originally endorsed by 314 Action, nine have made it past their primaries (one ran unopposed), nine lost, and five primaries (including Gupta’s) are still to come. Results for unendorsed science candidates have also been muddled. And in an ongoing Gallup poll that asks about the most important issues facing American society, few of the issues identified are particularly science related. It’s pretty clear that science isn’t going to be a single-issue vote for the left as, say, abortion is for some conservatives. But whenever I spoke with voters in Michigan’s 11th District — whether they leaned Democrat or Republican — they were all more concerned with the state of the roads we had driven on that day than with the technological decision-making behind that infrastructure. That lack of interest in Gupta’s tech expertise might make it hard for him to win the primary — without it, there’s not much to make him stand out from the pack. “I don’t think he’s found a breakthrough issue yet that separates him enough from the other candidates,” said Bill Joyner, a former county commissioner who served in part of the 11th District and remains involved in Democratic politics in the area. Most Democrats I spoke to told me they were still undecided in mid-July. Recent polling commissioned by the Detroit Free Press placed Gupta in third, 7 percentage points behind the front-runner, state Rep. Tim Greimel. But if he can win the primary, Gupta has figured out a way he might be able to make his science background work for him in the general election — not by appealing to science, but by tapping into a growing interest in outsider politicians. Student science, technology, engineering and math clubs are friendly ground for Gupta, who has been visiting groups throughout the district for months. He’s after the young members’ votes, of course. But he’s also there in the hopes of inspiring the next generation of science candidates — during a visit to the Oakland Community College STEMulated Club in Auburn Hills, Gupta asked club members about whether they might run for office someday. “I’m not a politician,” said Jaquan Brown, a computer science student who is spending his summer working on a project modeling wind patterns. “Hey, neither am I!” Gupta replied. That’s a message Gupta took everywhere — from that left-leaning college STEM club to an eagle-festooned room full of stone-faced retirees. “I’m not a politician, I’m a problem-solver.” To Gupta, science can bridge the gap between the left and the right — but so can dissatisfaction with political insiders. And while science doesn’t seem to be shifting elections, a general dislike for experienced politicians does. What’s important in voters’ minds is that politicians haven’t held elected office before. Incumbency is still the primary factor that determines whether a candidate will win an election, said Sarah Treul, a professor of political science at the University of North Carolina at Chapel Hill. But when there is no incumbent running — as is the case in the 11th — Treul’s research shows that it’s increasingly likely that the person with the least experience holding public office will walk away with the prize. These winners are seldom total political novices. They’ve worked on campaigns or they had been activists, or even just big donors, in the past. That’s true for Gupta (a former White House intern under Bill Clinton and a volunteer for the Obama campaign), as well as several other Democratic and Republican candidates for the 11th District seat. The filthiness of professional politicians came up in many conversations that I had with voters in the 11th District, and both Democratic and Republican activists in the district told me they expected an outsider to win the general election. The last two people to hold this congressional seat were first elected to Congress as novices. So it makes sense that Gupta’s stump speech highlights his outsider status in multiple ways. He’s not a politician — he’s a problem-solver who knows how to use technology to create practical solutions for tough problems. He’s not a politician — he’s a job creator who ran a successful startup firm. He’s not a politician — the only PAC he’s accepted money from is 314 Action. That could help him in a general election in a Republican-leaning district. Gupta told me he thinks it could help him even in the primary, though that’s less clear. Democrats don’t have as strong of an attraction towards inexperienced candidates — take Greimel’s lead in the primary as an example. But to Gupta, the real fight in American politics isn’t between Democrats and Republicans, it’s between average voters and the powerful special interests that professional politicians represent. In his vision, science and evidence are a thing the warring parties can agree on, and then use to fight the real enemy. There are real-world examples of science being exactly the kind of cross-party bridge builder that Gupta wants it to be. On July 23, U.S. Rep. Carlos Curbelo of Florida introduced a bill to create a market-driven carbon tax as a solution to climate change. Curbelo is a Republican, and he’s a member of the bipartisan Climate Solutions Caucus — 86 representatives, evenly split among Republicans and Democrats, all dedicated to advancing climate legislation. If Gupta and the organizers of the March for Science were granted one wish from a bipartisan fairy, climate legislation championed by lawmakers on both sides of the aisle would be it. But all the results of the politicization of science haven’t exactly been the stuff of scientific fantasy. Science can polarize people, as well as bring them together. The 2017 March for Science exacerbated — rather than healed — partisan divides, according to a survey published in the journal Political Science and Politics by Matthew Motta, a postdoctoral fellow in the science of science communication at the University of Pennsylvania. “In the aftermath, conservatives became more negative towards scientists and the science community, and so did moderates. But liberals became more positive,” Motta told me. Conservatives were more likely to believe scientists were out for personal gain after the march; liberals, less likely. While there is evidence that science can be a unifying force that all Americans trust, there’s also evidence that — particularly on specific issues — Americans increasingly have polarized ideas about who “science” serves and what “evidence-based” means. For instance, while the General Social Survey shows that overall public trust in science has held fairly constant since 1974, it also shows conservatives losing that trust. While conservatives once had the most trust in science, relative to liberals and moderates, they now have the least. Meanwhile, congressional voting records on environmental issues became significantly more polarized after 1990, with Republicans increasingly likely to vote against anything tainted green. And there is evidence of strong ties between science and the political left. Fifty-two percent of scientists self-report as liberal, for instance, while just 9 percent call themselves conservative. (Those numbers are even less balanced in some social sciences, like psychology.) And most political donations from scientists go to Democrats. Science is a uniter. Science is a divider. Science is a political Schrödinger’s cat. Matthew Wilk, a Republican activist from the Michigan 11th, told me that evidence and data do matter to the decision-making process among conservative lawmakers. He’d seen that when he was a member of the Northville School Board. He and other conservative lawmakers were hungry for data, he told me. But they didn’t necessarily want academics to interpret that data. They’d rather just get raw numbers and draw their own conclusions because they didn’t trust academia to play fair. “It’s seen as biased towards Democrats,” Wilk said. There’s knowing that science isn’t a partisan issue intellectually, though, and then there’s feeling it. Politics is more about the gut than the brain. Today, on both sides of the aisle, tummies are rumbling. This is where Gupta’s attempt to intertwine politics and science becomes an experiment as much as a campaign. Gupta talks about the importance of sharing evidence and learning. But twice on the campaign trail, Democratic supporters brought up fears about genetically modified food that aren’t supported by scientific evidence. And Gupta didn’t correct them. Instead, he pivoted to related issues of food security and safety that were less controversial. Politics might not be the best place to use science to change things people know with their guts. What you’re left with is a bunch of facts that don’t quite add up to an evidence-based path to political success. The American people really do trust scientific expertise. But having scientific expertise doesn’t seem to be a major factor in how they vote. Americans across the political spectrum still agree on science more than we disagree. But the same surveys show that partisan divides on science exist, and every time someone runs a political campaign using science as an issue, it could be contributing to a growing divide — making it harder for science to function as a nonpartisan problem-solver in the future. Science is a uniter. Science is a divider. Science is a political Schrödinger’s cat. For now, all Gupta can do is hope the beast is alive and well when the box opens. Which, for him, means continuing to push on the idea that he’s not a politician. He’s something else, and he can bridge divides. It’s an appealing message, said Maggie Peyton, a retiree to whom Gupta delivered a Meals on Wheels lunch one afternoon. “You’re almost talking my platform,” she told him. Though she and Gupta disagreed on abortion rights, Peyton encouraged him in his drive to get special interests out of Washington and fight career politicians. She’s one of those voters who Gupta told me he sees as a Republican with an open mind. And as he walked away from her door, pushing a cart loaded with lunch trays, Peyton waved and hollered after him. “Don’t let politics wreck you!” she said. A Democrat, David Curson, held the seat for two months after a special election in 2012. Before that, the last Democrat was in 1967.